This is pretty late but I have some story to share from last fasting month. We all know that Ramadhan can be tricky. Muslim fast to understand the suffering of the less fortunate people while helping to cleanse our body and make it healthier, but sometimes that can be very hard to achieve due to the bazaar popping up everywhere. I mean Malaysia is undeniably a food heaven and we have been confirming the fact over and over again! Thankfully during the Ramadhan last year I manage to stop myself from splurging too much on buying foods for iftar and instead my family also started to buy in just moderate amount (sometimes we just cook and buy nothing at all!). We ate just once during the iftar and managed skipped Morey (it's a Malaysian term for something like an after meal at night, mainly after Tarawih) through suhoor. Results? My body feels lighter and no more food coma! I bet it's a common dilemma shared by all of us. Gleneagles Kuala Lumpur wanted to educate people on practising a healthy eating habit during Ramadhan so they sent me some food package with a complete menu so I can try them out at home. I find them very fulfilling! They're actually really great to be used as daily menu even when the fasting month is already over. I am trying to practice healthy diet again, so it's time to collect all the menus that I have lying around for future reference. 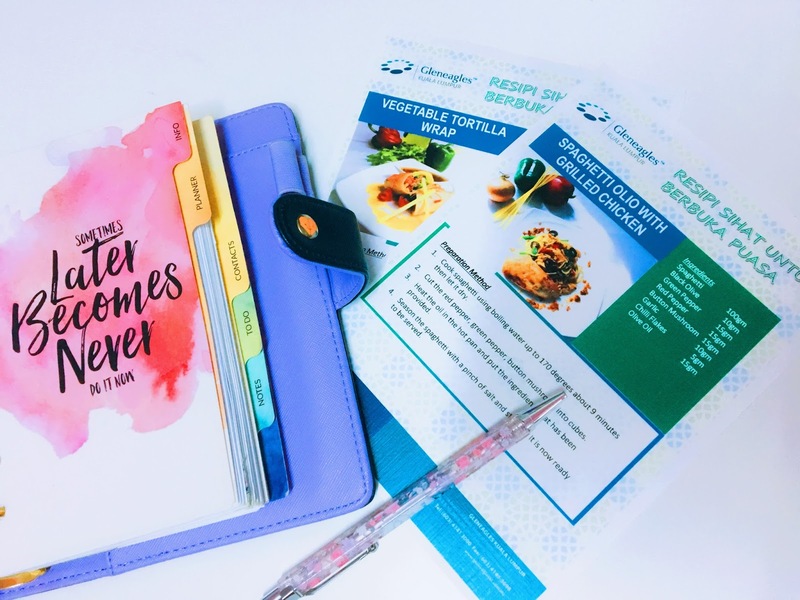 I have four set of healthy menus from Gleneagles Kuala Lumpur that were given to me, hope it'll be helpful for anyone who is looking for a health conscious dish to! 1. Cook spaghetti using boiling water up to 170 degrees for about 9 minutes then tossed them aside. 3. Heat the oil in the hot pan and put in the ingredients (the vegetables, garlic and chili flakes). 4. Stir them together and add spaghetti at the end with a pinch of salt. **Refer below for grilled chicken recipe. 1. Cook macaroni using boling water up to 170 degrees for about 8 minutes and toss them aside. 2. Cut tomatoes, red pepper, green pepper into Julian shape. 3. Heat up the oil in pan, and add the ingredients in. 4. Stir them together, add macaroni at the end with a pinch of salt. 3. Mix the vegetables with the vinaigrette dressing. 4. Put all ingredients in the bread and roll to be served. 2. Take one tortilla bread for wrapping and rolled the vegetables and chicken mix in. 3. Can also be served together with the vinaigrette dressing. 1. Marinate the ingredients together for about 15-30minutes. 2. Add olive oil to grilling pan to heat and add the chicken once the oil is hot enough. 3. Make sure not much oil is used and the chicken is cooked well on both side. Thank you once again to Gleneagles Kuala Lumpur for sending me a great guide to try at home!